One of the main constituents of the skin is hyaluronic acid. Hyaluronic acid is responsible for skin hydration. It has an amazing ability to hold up to 1000 times its weight with water which helps it maintain skin smoothness and volume. As we become older the amount of hyaluronic acid in our skin decreases which leads to loss of volume. 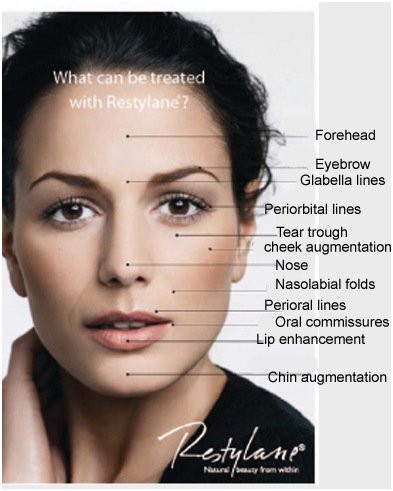 Dermal Fillers such as Restylane®,Emervel® and Juvéderm® are composed of stabilized hyaluronic acid therefore when we inject these into the skin we are effectively giving our own hyaluronic acid a helping hand, helping it to restore volume and lift the skin to smooth away and soften the appearance of facial lines. It is a non animal product and patch testing is not required. Fillers are used most commonly to smooth nose to mouth lines and to enhance the lips, but can be used to treat most lines and wrinkles. Hyaluronic acid is a natural product and will, through time be completely broken down. Facial lines generally show improvement for 9-12 months. Please call reception on 01952 459459 to arrange a consultation. This appointment is with Dr Ashok Jakhu who will help decide if it is the right treatment for you. You’ll have the opportunity to ask any questions you may have about the treatment. We suggest thinking about what you want to ask before you come, perhaps even writing down a list of questions. Dr Jakhu will explain how treatment works, the potential side effect for the area that you wish to have treated, and will ask you questions about your medical history. From £225….Please ask for more information.